Dry hull weight. . . . . . . . . . . Power. . . . . . . . . . . . . . . . . . . 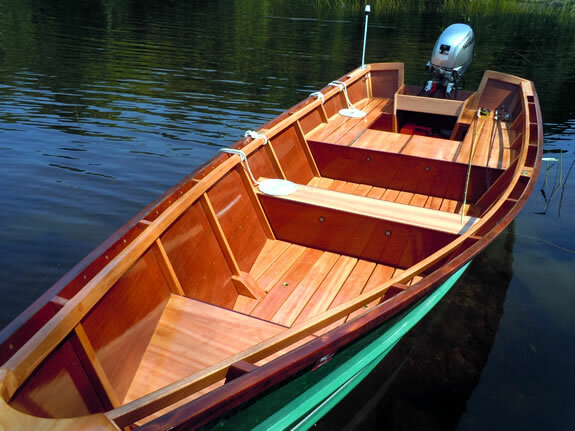 Here we have photos and specifications of a small wood boat, suitable for the amateur wooden boatbuilder, or have us build it for you. 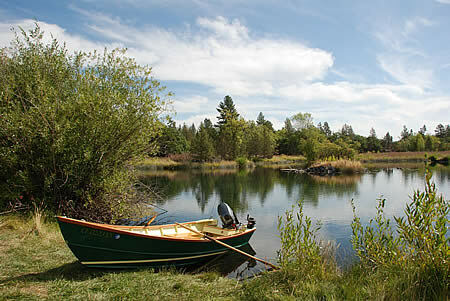 She is a fine craft for sport fishing, crabbing, or camping. This 16' Dory offers the seaworthiness and ability of our larger boats for those who want the same great features in a smaller package. Whether your favorite boating is on open salt water, lakes, or rivers, you'll appreciate having a boat that takes rough seas and still works for beach camping. Dories are famous for their seaworthiness. The high bow and deep sides of the NEXUS 16' Dory will shed rough water and give you a feeling of confidence and safety you have never experienced in a 16' boat. Go birding in the sloughs, camping in the islands, salt water fishing, or crabbing. The spacious cockpit area, and the boat's handiness, light weight, and strong hull construction demonstrate her suitability as an all purpose hunting, fishing, and camping boat. 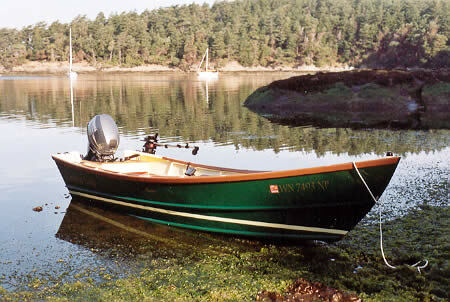 Here again, NEXUS proves that a practical wood boat can also be beautiful. 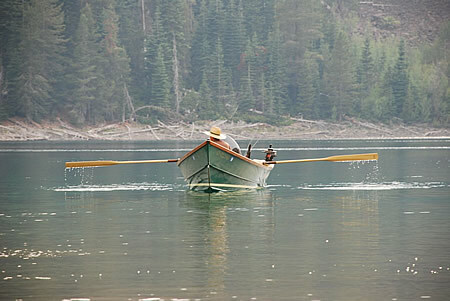 The NEXUS 16' Dory is perfect for anyone who wants a small wood boat that has the clean flowing lines and traditional appearance of a fine wooden boat, and is also tough, leakproof, and durable. 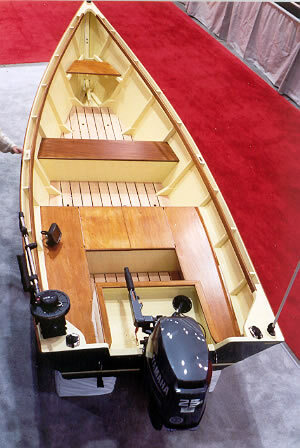 If you choose to buy the plans and build this boat yourself, the designer intends that this dory be built using WEST SYSTEM® or similar marine epoxy glue. 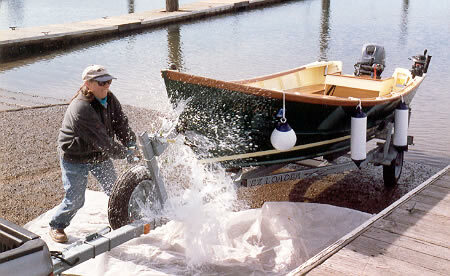 This boat is easily trailerable and will not dry out or leak if left out of the water for prolonged periods. A good day for a launch. Nancy shows us how it's done. Follow through, and hold your mouth just right. Oh, and hit the trailer, not the boat! This is a good looking boat by anyone's measure. She'll look at home and attract attention in any harbor in the world. You can judge the depth of the boat a bit by the 20HP long shaft motor that's on the transom. That bow has some authority. There's lots of room in here for gear and a platform for casting. The cockpit allows the person at the tiller to be well braced. Here's a shot from our display at a recent boat show. 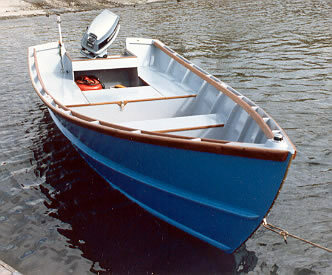 We coated the seat tops, rails, and trim of this dory with Cetol. She's plenty fast with small power and handles a bit of chop. She goes where you point her, which is always a good thing. Even going at a good clip, you don't spill that much champagne and there's very little spray or other fuss. Cordova Lady's owner demonstrates that it's also possible to run slowly. 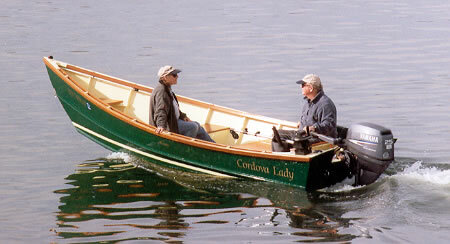 Cordova Lady also likes to go fishing and camping in the San Juan Islands. After all, that's what it's for. Further adventures of The Green Boat: here she is in Crater Lake . . . In the Fall River valley . 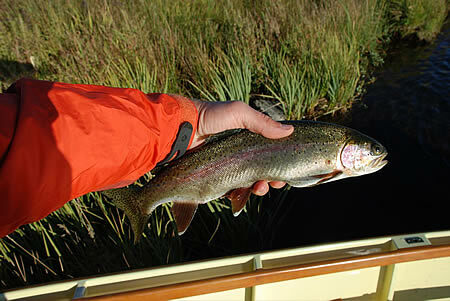 . .
And with wild trout up the Fall River. A new launch by one of our amateur builders. Nice job!